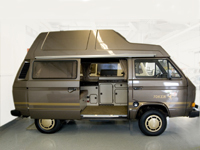 The 1984 Volkswagen Watercooled T25 / T3 Westfalia Joker Jubilee Special Edition Model History. 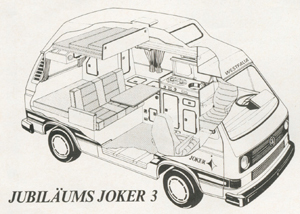 In 1984 Westfalia introduced a special edition called the Jubilee Joker (Jubiläums Joker) model. It was to celebrate that 250,000 Westfalias had been built. X4X4 Bronze Beige Metallic (LH8U) (Bronzebeige Metallic) - Interior upholstery light beige (UH) with dark brown dashboard and steering wheel. 1) Combination cupboard 87 cm wide x 45 cm deep on the left behind the drivers seat with sink, two flame cooker with splash plate. The splash plate folds down and can be used to drain dishes after washing. Also the unit has a cutlery draw, a large cupboard for tableware and the fridge. 2) Cupboard unit with integrated freshwater tank. 3) Wardrobe and storage unit over the engine bay. 4) Roof locker below roof bed. 5) Cushion 120 cm wide over the engine bay. 6) 3/4 width rock n roll bed for 2 persons (bed is 188 cm x 120 cm when folded out) with bedding storage area under seat. 7) Rear table on swinging arm (80 cm x 40 cm) with dark brown surface finish and dark brown edging trim. 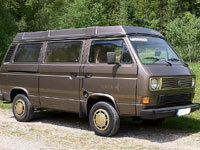 The 1984 model year Volkswagen Westfalia Jubilee Joker had beige furniture and the upholstery was a beige brown velour. Having the same layout as the Westfalia Jubilee Joker 1 but with a hightop option. 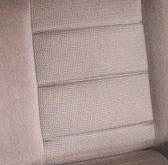 The 1984 model year Volkswagen Westfalia Jubilee Joker had beige furniture and the upholstery was light beige brown velour material. This material seems to be harder wearing than the earlier options but can still show signs of wear on seat edges etc. The curtains were made from a beige brown material. Fibreglass roof painted to match bodywork colour in bronze beige metallic. Luggage rack over the drivers cab. 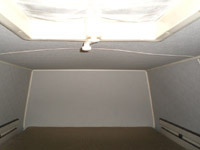 Inner lining of roof was a soft flock material. Canvas had a large opening aperture at the front with a zippable mosquito net. 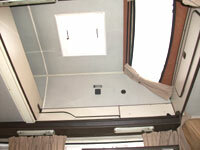 Fibreglass roof had an opening plastic window (29 cm x 39 cm) with mosquito net and blackout curtain. Double bed in pop top roof 185 cm x 122 cm. Large plastic double glazed panorama window at the front. Insulated with 25 mm insulation. One 40 cm x 40 cm lifting air vent with mosquito net. Front cupboard locker over drivers cabin. Fixing point in hightop roof for the surfboard rack (surfboard rack was available as an option at extra cost). Double bed in hightop roof 194 cm x 116 cm. The rear floor was a lino type material and this was covered by a removable square tan coloured brown carpet with a non slip rubber backing. The front carpet in the cab was a tan coloured brown. 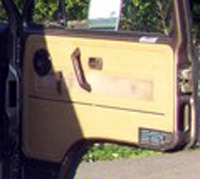 On the 1984 Westfalia Jubilee Joker the door trims and seat vinyl were beige brown. The door trim had a matching material padded insert. Insulated on all inner bodywork in the living area with 25 mm thick mineral fibre plates. Floor area has a plywood sheet with PVC covering. The side walls and roof panels are made from lighter imitation leather. In some panels there is a padding of matching “Saiga” material. Both the Jubilee Joker 1 (Pop Top) and Jubilee Joker 3 (High Top) had 5 tinted and double glazed windows in rear living area. The window above the cooker opens. High quality cotton curtains all round including drivers cabin area. The curtains for the sliding door and front windscreen were clipped on when required. 220 Volt external hook up with internal outlet socket and safety trip cut out. 63 Amp leisure battery with split charge relay and automatic battery charger. 55 Litre Freshwater tank with electric pump and lockable cap. 20 litre waste water tank under the vehicle. External underbody 8kg LPG tank. The fittings, filler and gas regulator are behind a locking PVC cover. Eis-ex (gas preheater for extreme cold temperature use), activated when needed. Combination cupboard 87 cm wide x 45 cm deep on the left behind the drivers seat with sink, 2 flame cooker with splash plate. The splash plate folds down and can be used to drain dishes after washing. Also the unit has a cutlery draw, a large cupboard for tableware and the fridge. Diode control display system on the kitchen unit showing fresh water tank level, leisure battery charge level and indicator when fridge is running on gas. All furniture is five sheet laminated and 15 mm thick plywood with a beige PVC coating and brown PVC edging. The upholstery is beige brown velour material. The seat rear and side surfaces are light beige imitation leather. 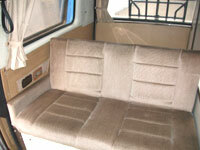 Rock N Roll Seat / Bed for 2 people in the rear with 120 cm wide upholstered cushion over the engine bay. Roof locker cupboard above rear seat with shelf accessible from rear tailgate area. Wardrobe and small cupboard rear left over the engine bay. Storage unit along the side with 3 stowage areas. Rotating table (80 cm x 40 cm) on metal arm for rear living area. Table top and kitchen top surface are finished in dark brown. 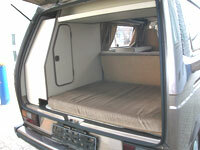 Double bed when rock n roll bed folded down including cushion over engine bay (188 cm x 120 cm). 42 litre fridge working from 12v, 220v and gas. Eberspacher 2300 petrol thermostatically controlled night heater with blower installed under the vehicle (uses about 1/4 litre of petrol per hour. JOKER logos on the outside in gold. 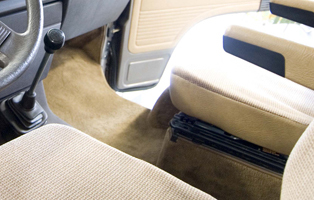 Two Westfalia Comfort seats in drivers cabin with armrests and integrated headrests. Two runners in rear floor to allow fitting of optional rotating single seat.??? All inner surfaces and hardware finished in Achat brown.??? Four wheel trims in gold colour. Front headlight grill in gold colour. Velour carpet for rear living area. Westfalia Radio package “Blaupunkt Heidelberg SQR 24”, four x 15 watt loudspeakers ( two mounted in the rear roof locker and two in the cab doors, Fader and aerial. M054 Lockable glove box lid. M089 Windscreen in laminated safety glass. M206 Dipping rear view mirror. M386 Carpet over front wheel arches inside bus. M511 Instrument panel part padded. M621 90 Amp alternator (only for hightop vesions). 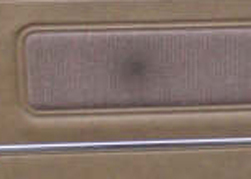 M643 Storage pocket on drivers door. M690 / 693 Rotating seat frame for driver and passenger seats. Z25 M-Packet including digital clock and rev counter with resettable mileage trip, Rubber trim on bumpers, Quarter light windows in cab. 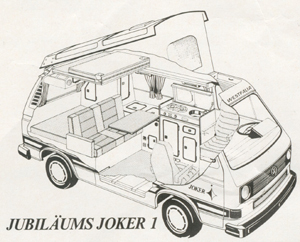 The brochure for this special addition Westfalia Jubilee Joker does not list any additional options. I guess either it wasn’t possible to order options for this model or more likely is that the options would be ordered using the order numbers from the standard Joker range. Freestanding Awning (350 cm x 230 cm). Over roof complete with supports. Order Number 216 008 433 001, Cost 1830 DM. Freestanding Awning (295 cm x 210 cm). Over roof complete with supports. Order Number 216 009 433 001, Cost 1199 DM. Freestanding Awning (350 cm x 280 cm). Order Number 216 008 433 010, Cost 635 DM. Sun Awning (250 cm x 190 cm). Order Number 216 006 433 010, Fastens to the guttering on van, Cost 152 DM. Pull out side awning (250 cm x 190 cm), Sun / rain Awning in compact Aluminum housing. Order Number 538 199 538 205, Cost 831 DM. PVC coated tarpaulin material luggage bag for the luggage rack above the front cabin (not for Club Joker 3 high top). Order Number 216 004 443 001, Cost 158 DM. Roof bars for VW Transporter T3. Order Number 216 002 434 020, Cost 556 DM. Swinging arm attachment set for one surfboard. Order Number 216 001 434 021, Cost 215 DM. Adaptor bracket set for one surfboard. Order Number 216 001 434 022, Cost 122 DM. For Westfalia Joker high top (after 08/84). Order Number 216 003 434 020, Cost 464 DM. Ski Holder (4 pairs of ski) for VW Transporter tailgate. Order Number 539 080, Cost 385 DM. Insulated cover for pop top canvas when roof is up. Order Number 504 572, Cost 324 DM. Mosquito net for the double glazed window over the cooker. Order Number 216 005 238 001, Cost 50 DM. Mosquito net for the tailgate (van is already fitted with press studs for this as standard). Order Number 216 004 238 001, Cost 68 DM. Mosquito net for the sliding door. Order Number (Not sure because this was a special edition), Cost 98 DM. Child net for inside Joker 1 pop top roof. Order Number 216 007 237 020, Cost 64 DM. Child net for inside Joker 3 high top roof. Order Number 216 015 113 050, Cost 64 DM. 12 volt magnetic light. Order Number 216 014 345 001, Cost 46 DM. Connecting cable 1.4 meter long for between vehicle and cable drum. Order Number 507 698, Cost 31 DM. Twenty five metre 220 volt mains hook up cable drum. Order Number 507 906, Cost 286 DM. Adaptor for filling gas tank in France and Italy. Order Number 523 266, Cost 39 DM. Water canister (10 litres) with funnel. Order Number 504 051, Cost 22 DM. Universal folding table stand. Order Number 216 027 227 001, Cost 61 DM. Fire extinguisher with holder 1kg. Order Number 216 011 250 010, Cost 53 DM. Fire extinguisher with holder 2kg. Order Number 216 012 250 010, Cost 74 DM. Head cushions for comfortable sleeping with Saiga brown beige cushion. Order Number (Not sure because this was special edition model), Cost 53 DM. Please note that some of the links take you to an external site called vwpix.org which is an excellent source of sales literature for all versions of VW camper van. Most of the brochures are in German language as this was the main market. November 1984 VW Westfalia Accessories Price List (2 Pages Black And White). To get notifications when this website is updated subscribe to my VW Camper Blog or Follow Us on Facebook.